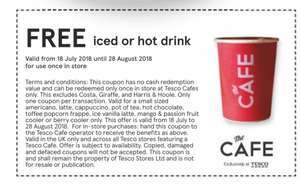 On Page 62 of the July/August 2018 FREE Tesco Magazine there is a voucher to cut out and present to cafe staff for a FREE iced or hot drink from the stated drinks on coupon. These magazines are available in stores at the end of the checkouts commonly in large pallets. Fill your boots and grab a few magazines before they run out - it helps …Fill your boots and grab a few magazines before they run out - it helps when you have children and can get a free drink for them as well.My nearest Tesco is close to a Costa, so although the coffee isn't as nice, it's free and they also have wifi, so helps cut the cost of a shopping trip, and that can't be bad. Fill your boots and grab a few magazines before they run out - it helps when you have children and can get a free drink for them as well. 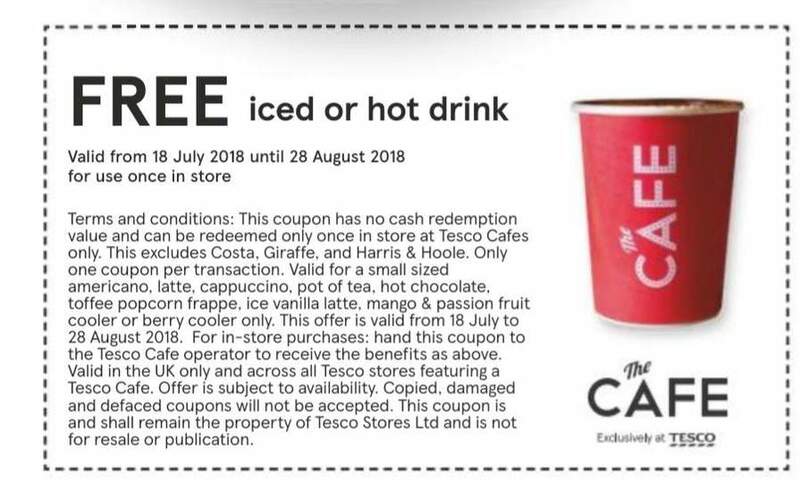 My nearest Tesco is close to a Costa, so although the coffee isn't as nice, it's free and they also have wifi, so helps cut the cost of a shopping trip, and that can't be bad. Thanks, for the heads up. I used this last time. My 4 year old also gets a free piece of fruit whilst we are in Tesco. Thanks, for the heads up. I used this last time. My 4 year old also gets a …Thanks, for the heads up. I used this last time. My 4 year old also gets a free piece of fruit whilst we are in Tesco. The free fruit is great And no worries Enjoy! Can't say no to a cool drink in this heat! last one I could find expired in January and was for hot drinks only. Where?It would help if you could post the link...last one I could find …Where?It would help if you could post the link...last one I could find expired in January and was for hot drinks only. Thanks! I too couldn't see it anywhere except a similar but not as good duration deal which requires you to sign up to Baby Club! hotukdeals.com/dea…941 Perhaps @Darzen could explain himself!!! Yes, but this is long duration multiple uses that just requires you to pick up coupons in the free in-store magazine and a company doesn't keep your details!! Many people don't even look at or notice these magazines!! Please mention a link to the post, many thanks. How much will tesco regret this move!!! Good find Op. They've done it before for hot drinks, but shouldn't have much effect as people don't tend to pick up the magazines!! Yes, but this is long duration multiple uses that just requires you to …Yes, but this is long duration multiple uses that just requires you to pick up coupons in the free in-store magazine and a company doesn't keep your details!! And there's a tesco cafe in every town and city in Britain (Manchester has 20+) as opposed to John Lewis not being very common. This is great, I went and got a iced drink yesterday, very sweet, brought a extra coupon to get the homeless guy who sits outside something, he wasn't there so I gave it to a older lady behind me she was very happy and I told her where to get them. Quite good for the homeless otherwise known as the mentally ill thrown on To the streets via the Tory back in the community policy. Used 2 of them and will use 2 this weekend and will pick magazines for coming week. That's a shame, some stores have both in my area, but most are Tesco Cafés: I need to grab some magazines! Did anyone get told they’d need to buy something to get it? Nope! Absolutely NO purchase necessary! Just read back the voucher ts&cs to them!!! That’s annoying! My nearest Tesco has a Harris and Hoole and the next 4 nearest ones have a Costa!! Anyone got a list of stores in London ?